Cardiff City reached the League Cup semi-finals for the first time since 1966 on an emotional night following the death of Wales manager Gary Speed. Kenny Miller put Cardiff ahead on 19 minutes after Aron Gunnarsson's pass pierced the static Rovers defence. Miller was denied a second by Scott Dann's goal-line clearance, before Rovers captain David Dunn went close. Filip Kiss headed the second after the break and Cardiff held on to heap more pressure on Blackburn boss Steve Kean. Blackburn, propping up the Premier League table, managed just one effort on target after conceding the second and struggled to generate any semblance of concerted pressure on their Championship hosts. 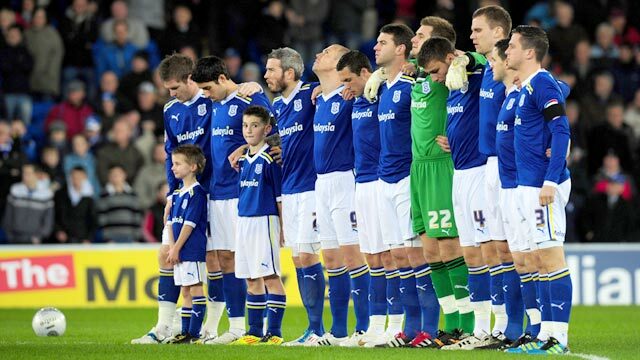 Poignant scenes preceded the match as respect was paid to Wales manager Gary Speed, whose body was found on Sunday. During a minute's applause, both managers were joined by Football Association of Wales chief executive Jonathan Ford in laying wreaths on a Welsh flag at the side of the pitch. A minute's silence followed, before the cry of "there's only one Gary Speed" echoed around the stadium - the scene of Speed's last game 17 days ago. Under the cloud of such tragic circumstances, the match took its time to ignite, with Blackburn enjoying the better start in possession. The first corner after 18 minutes brought the first moment of danger as Grant Hanley's header was blocked on its way to Cardiff's bottom corner. But barely two minutes later, the predatory Miller struck for the Bluebirds in their first meaningful attack. Gunnarsson robbed the dithering Morten Gamst Pedersen in midfield, and his instinctive pass sent Miller clear through the heart of the Blackburn defence. Miller's touch took him towards the left side of the box, but his low left-footed shot went through the legs of the on-rushing Mark Bunn for his sixth goal of the season. Only inches prevented Miller from doubling Cardiff's lead five minutes later. The Scotland international beat Hanley on the byline, dummied his way past Bunn but Dann blocked his shot on the line. A goalmouth scramble ensued, but again the visitors managed to clear. 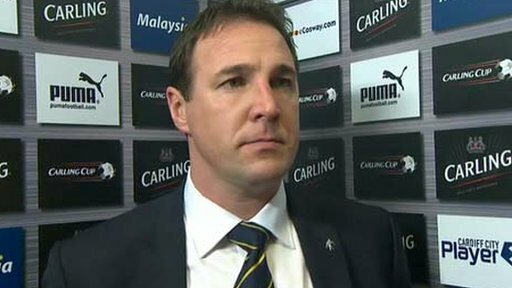 Cardiff grew in stature from then, their pressing game giving Blackburn no time to find any midfield rhythm. Rovers captain Dunn, one of five changes in the side from Saturday's defeat to Stoke, had blazed over from the edge of the box in the opening stages, and he finally called Tom Heaton into action in the Cardiff goal when he connected well with a 30-yard volley. 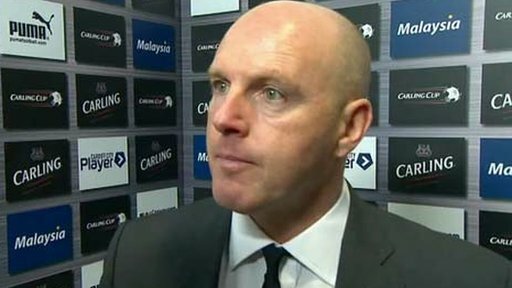 Kean, battling for his Blackburn future, sent his side out early for the second half, but he was soon staring at a two-goal deficit. Peter Whittingham's deep corner eluded Bunn's grasp, and Kiss was only a yard out when he deflected the ball in after Anthony Gerrard headed across the face of goal. Both players claimed the goal, but replays clearly showed Kiss having the final touch. Cardiff's movement continued to trouble Rovers, with Gunnarsson shooting wide, before setting up Miller again, who this time fired wildly over. Whittingham's influence grew as the home side controlled midfield, and right-back Kevin McNaughton then epitomised Cardiff's energy as his 30-yard run ended with a driven shot across Bunn's goal. After conceding the second, David Goodwillie soon forced a fine save from Heaton but that proved to be Blackburn's only second-half effort on target. They came close in the closing stages, but Dann's header and substitute Ruben Rochina's curler from the edge of the box went inches wide. Kean sent on Ayegbeni Yakubu and Jason Roberts in the final stages in hope of a late rally, but the faultless home defence held firm to extend Cardiff's unbeaten run to eight games. 93:52 The match has reached full-time. 90:00+1:17 Jason Roberts has an effort at goal from deep inside the area missing to the left of the target. 90:00+0:37 Shot from just outside the box by Joe Ralls misses to the right of the target. 88:32 Free kick crossed left-footed by Morten Gamst Pedersen from left channel, save by Tom Heaton. 88:32 Booking Kevin McNaughton shown a yellow card. 88:20 Kevin McNaughton gives away a free kick for an unfair challenge on Ruben Rochina. 83:48 Ruben Rochina gives away a free kick for an unfair challenge on Joe Ralls. Peter Whittingham takes the direct free kick. 82:42 Substitution Craig Conway leaves the field to be replaced by Joe Ralls. 79:44 Kenny Miller gives away a free kick for an unfair challenge on Jason Lowe. Jason Lowe takes the direct free kick. 78:48 Substitution (Blackburn) makes a substitution, with Jason Roberts coming on for Nick Blackman. 78:48 Substitution David Goodwillie leaves the field to be replaced by Ayegbeni Yakubu. 78:48 Close range headed effort by Scott Dann goes wide of the left-hand upright. 76:31 Substitution Filip Kiss leaves the field to be replaced by Stephen McPhail. 75:42 Free kick awarded for an unfair challenge on Nick Blackman by Filip Kiss. Nick Blackman takes the free kick. 74:52 Kevin McNaughton has an effort at goal from the edge of the area that misses to the right of the target. 73:04 Filip Kiss concedes a free kick for a foul on Ruben Rochina. Morten Gamst Pedersen crosses the ball in from the free kick, Anthony Gerrard makes a clearance. 71:20 Free kick awarded for a foul by Craig Conway on Jason Lowe. Mark Bunn takes the direct free kick. 70:49 Free kick awarded for an unfair challenge on Craig Conway by Jason Lowe. Free kick taken by Ben Turner. 69:40 Substitution Ruben Rochina comes on in place of Radosav Petrovic. 69:40 Headed effort on goal by Craig Conway from inside the penalty box misses to the right of the goal. 68:34 Free kick awarded for a foul by Nick Blackman on Craig Conway. Tom Heaton restarts play with the free kick. 68:01 Effort on goal by Kenny Miller from just inside the area clears the crossbar. 65:13 Unfair challenge on Mauro Formica by Filip Kiss results in a free kick. Morten Gamst Pedersen fires a strike on goal direct from the free kick, save by Tom Heaton. 63:37 Shot from close range by Kenny Miller misses to the right of the goal. 61:57 Shot from just outside the area by Aron Gunnarsson misses to the right of the target. 58:19 David Goodwillie takes a shot. Blocked by Anthony Gerrard. 57:43 David Goodwillie takes a shot. Save by Tom Heaton. 57:15 Morten Gamst Pedersen takes the inswinging corner, clearance made by Kenny Miller. 53:19 Aron Gunnarsson takes a shot. Save by Mark Bunn. 49:17 Assist on the goal came from Ben Turner. 49:17 GOAL - Anthony Gerrard:Cardiff 2 - 0 Blackburn Anthony Gerrard scores a goal from close in to the bottom left corner of the goal. Cardiff 2-0 Blackburn. 49:04 Corner taken left-footed by Peter Whittingham. 47:47 Filip Kiss takes a shot. Save by Mark Bunn. 45:06 Corner taken by Morten Gamst Pedersen, save by Tom Heaton. Outswinging corner taken from the left by-line by Morten Gamst Pedersen. 45:00+1:55 The whistle is blown to end the first half. 45:00+1:31 Corner taken left-footed by Morten Gamst Pedersen to the near post, Kenny Miller makes a clearance. 45:00+0:54 The free kick is swung in left-footed by Morten Gamst Pedersen, clearance made by Ben Turner. 45:00+0:54 Booking Anthony Gerrard receives a caution. 45:00+0:43 Nick Blackman fouled by Anthony Gerrard, the ref awards a free kick. 43:50 Craig Conway takes a shot. 38:27 Inswinging corner taken from the left by-line by Craig Conway, clearance made by Gael Givet. 36:13 David Dunn takes a shot. 35:30 Outswinging corner taken from the left by-line by Morten Gamst Pedersen, Anthony Gerrard makes a clearance. Morten Gamst Pedersen takes a outswinging corner. 34:24 David Dunn takes a shot. Save by Tom Heaton. Morten Gamst Pedersen takes the inswinging corner, save by Tom Heaton. Outswinging corner taken by Morten Gamst Pedersen, clearance by Filip Kiss. 33:12 Mauro Formica fouled by Kevin McNaughton, the ref awards a free kick. David Dunn takes the direct free kick. 32:32 Scott Dann challenges Ben Turner unfairly and gives away a free kick. Tom Heaton restarts play with the free kick. 32:02 Filip Kiss challenges Radosav Petrovic unfairly and gives away a free kick. Direct free kick taken by Mark Bunn. 30:59 Peter Whittingham takes a shot. 30:38 Corner taken by Peter Whittingham from the right by-line played to the near post, clearance by Radosav Petrovic. 29:59 Peter Whittingham crosses the ball in from the free kick, clearance made by Jason Lowe. 29:59 Booking Jason Lowe goes into the book for unsporting behaviour. 29:44 Foul by Jason Lowe on Craig Conway, free kick awarded. 25:50 David Dunn gives away a free kick for an unfair challenge on Anthony Gerrard. Peter Whittingham crosses the ball in from the free kick. 24:57 Effort from inside the six-yard area by Kenny Miller bounces off the post. 23:21 Free kick awarded for an unfair challenge on Gael Givet by Don Cowie. Morten Gamst Pedersen sends in a cross, Grant Hanley takes a shot. Tom Heaton makes a save. 21:14 Grant Hanley takes a shot. Tom Heaton makes a comfortable save. 20:30 Corner taken by Morten Gamst Pedersen from the right by-line played to the near post, save by Tom Heaton. 19:00 Aron Gunnarsson provided the assist for the goal. 19:00 GOAL - Kenny Miller:Cardiff 1 - 0 Blackburn Kenny Miller scores a goal from inside the penalty area to the bottom left corner of the goal. Cardiff 1-0 Blackburn. 17:39 Morten Gamst Pedersen takes the inswinging corner, Grant Hanley takes a shot. Save made by Tom Heaton. Effort on goal by Radosav Petrovic from just outside the area goes harmlessly over the target. 14:06 Free kick awarded for a foul by Aron Gunnarsson on David Dunn. Mark Bunn takes the direct free kick. 13:30 Free kick awarded for a foul by David Goodwillie on Anthony Gerrard. Free kick taken by Anthony Gerrard. 12:56 Foul by David Goodwillie on Peter Whittingham, free kick awarded. Aron Gunnarsson takes the direct free kick. 10:32 The referee blows for offside against Kenny Miller. Indirect free kick taken by Mark Bunn. 9:19 Effort from inside the area by David Goodwillie misses to the right of the target. 4:04 Mauro Formica fouled by Filip Kiss, the ref awards a free kick. Morten Gamst Pedersen shoots direct from the free kick, blocked by Aron Gunnarsson. 1:44 Filip Kiss challenges David Dunn unfairly and gives away a free kick. The free kick is delivered left-footed by Morten Gamst Pedersen from right channel, clearance by Don Cowie.